Last week, CBS announced that they would be featuring a sizzle reel for Supergirl, featuring new footage from the first season, during the season two premiere of Scorpion. If you weren’t able to catch the trailer during the premiere, that’s alright because CBS has released the trailer on YouTube which you can catch below – beware of some spoilers for future episodes of Supergirl! Supergirl will have its series premiere on Monday, October 26 at 8:30 PM before going back to its regular time slot at 8 PM the following Monday, on CBS. Let us know in the comments below what you think of the new trailer! Welcome to Supergirl Radio - your podcast for all things related to CBS' hit series, Supergirl! Andrew Kreisberg Calista Flockhart Cat Grant CBS Chyler Leigh David Harewood David Rapaport DC Comics DC Entertainment Dean Cain Geoff Johns Glen Winter Greg Berlanti Helen Slater Jeremy Jordan Kara Zor-El Mehcad Brooks Melissa Benoist Michael Bailey News Rebecca Johnson Sarah Schechter Supergirl Supergirl Radio Teresa Jusino Warner Bros TV. I understand that the powers that be at CBS do not want Supergirl to cross over to any of the shows on the CW network, at least until her show takes off, which from the promos I’m sure it will. 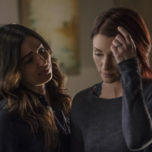 I agree with their decision because it looks like her show will not be as dark as the CW shows are and more like ‘Lois & Clark’ and that fits the character better, but I hope that down the line that in the second season or late in the first season CBS would agree to The Flash or The Green Arrow making a guest or cameo appearance on her show on the CBS network.